The IDF “must prepare itself in advance” to switching from mandatory to an all-volunteer draft model, says research from the Israel Defense Forces’ behavioral science center, obtained by Haaretz and published on Sunday. 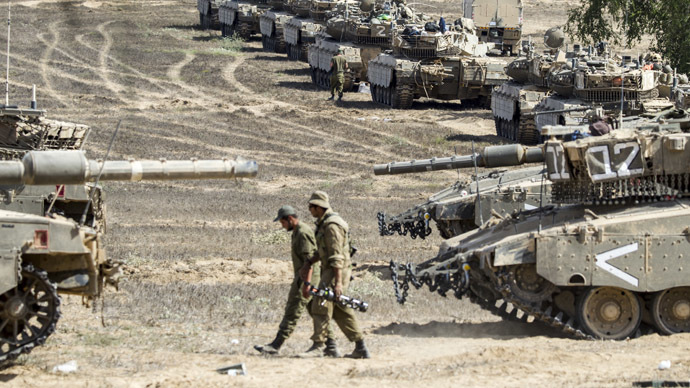 “Based on processes studied in foreign armies, it can be said that in many ways, Israel and the IDF are currently in the process of changing from a mandatory draft model to an alternative one,” says Yuval Benziman, author of the report and a researcher who specializes in the relationship between the IDF and Israeli society. Among factors leading to the abandonment of the compulsory draft include a gap between the large number of those required to go into the army and a smaller amount of those actually drafted (as many find ways to avoid military service), the army service losing its prestige, and people objecting to substantial military spending, according to the document. Some of the activists who signed the letter wished to remain anonymous. During Israel's seven-week Operation Protective Edge, launched on July 8, more than 2,100 Palestinians were killed – most of them civilians. Among the victims were at least 469 children, according to a senior UN Children’s Fund (UNICEF) official. The operation’s goal was to end Hamas rocket fire from the Gaza Strip territory. Israel’s excessive use of force has been criticized by the international community. The UN's top human rights official, Navi Pillay, condemned Israel's military actions in July, stating that war crimes may have been committed. In response, a top government official said that the authors of the letter were mistaken about the morality of the IDF. “The IDF was and is the most moral army in the world. I would suggest that the authors of this letter – who 'bravely' chose to remain anonymous – to go speak to residents of Sderot, who have to wake up in the middle of the night and make their way to bomb shelters,” said Deputy Education Minister Avi Wortzman, as quoted by Arutz Sheva news website on Sunday. The boycott letter is part of a string of similar actions that began in March, when another 50 teens sent an open letter to Prime Minister Benjamin Netanyahu declaring their opposition to being drafted into the military because of Israel’s policies surrounding West Bank settlements. In September, 43 veteran reserve army mid-ranking officers and soldiers directed a letter to Netanyahu, IDF Chief of Staff Benny Gantz, Defense Minister Moshe Ya'alon, and head of military intelligence Aviv Kochavi, in which they refused to be part of any actions which "harm the Palestinian population in the West Bank." It also mentioned the “collective punishment” of residents in Gaza, as it came right after the 50-day Gaza war. “Intelligence allows ongoing control over millions of people, thorough and intrusive monitoring and invasion into most aspects of life. All of this does not allow for normal living, fuels more violence and puts off any end to the conflict," said the reservists in an anonymous letter published by the widely read Yedioth Ahronoth newspaper. The serving and former soldiers belong to Unit 8200, a former Israeli SIGINT National Unit. It is the military’s primary signal-intelligence body – the Israeli equivalent to the US National Security Agency (NSA). The IDF denounced the letter as a publicity stunt, saying that the fact the soldiers went to the media raises doubt as to the seriousness of their claims. The former head of Unit 8200, Brigadier General Hanan Gefen, commented by saying: “If I was the unit's commander I would have terminated their [protesters] service, court-marshalled them, and ask for severe punishment. They used confidential information, which they privy to during their service, to promote their political agenda," i24news reported.